The ripe fruits of perennial plant of either Schisandra chinensis (Turcz.) 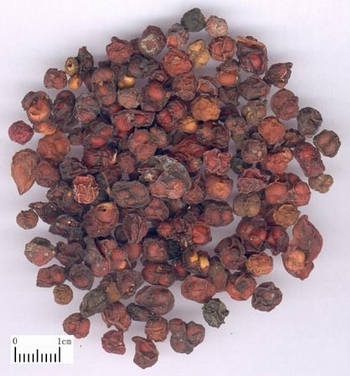 Baill or Schisandra sphenanthera Rend. et Wills, perennial herb of family Magnoliaceae. The former is called Bei Wu Wei Zi (Northern Fructus Schisandrae), and the latter is Nan Wu Wei Zi (Southern Fructus Schisandrae). Bei Wu Wei Zi is mainly produced in northeast of China, the other is in southwest of China and southern parts of Yangtze River Valley. Collected ripe fruits in autumn and dried. Light smell, sour in flavor, after the broken of seeds, fragrant, bitter and pungent. Smaller, reddish-brown or dark-brown peel, wizened, the fruits and seeds are tide. The former is better. Red, large, thick fruit, oily, lustrous. Unprocessed, or mixed with vinegar or honey and steamed and then dried in the sun. Sour, sweet, warm; lung, heart and kidney meridians entered. Astringe lung and intestines, secure essence, replenish qi and nourish kidney, promote the generation of fluid to relieve thirst, calm heart and induce tranquilization. It is an important herb for chronic cough and dyspnea of deficiency type due to lung and kidney deficiency. Because it is sour and sweet, it can astringe lung to relieve cough and dyspnea, tonify lung qi and nourish kidney yin. For chronic cough due to lung deficiency, it could be decocted in plaster, or sliced singly, or combined with lung-astringing and cough-relieving herbs. For cough, shortness of breath, fatigue and mental fatigue, it is combined with qi tonics and cough-relieving herbs. For instance, it is used with Ren Shen, Huang Qi, and Zi Wan in the formula Bu Fei Tang from Yong Lei Qian Fang (Yongleiqian's Prescription). For cough and dyspnea due to both lung and kidney deficiency, it is combined with lung and kidney-tonifying herbs. For instance, it is used with Shan Zhu Yu, Shu Di Huang, and Shan Yao in the formula Du Qi Wan from Yi Zong Ji Ren Bian (Self-tasked Book of Medicine). It is good at astringing lung to relieve cough, but it is also indicated for cough and dyspnea due to fluid retention when combined with lung-warming and fluid-retention-removing herbs. For instance, it is used with Xi Xin and Gan Jiang in the formula Ling Gan Wu Wei Jiang Xin Tang from Jin Kui Yao Lue. It can astringe intestines to stop diarrhea. For chronic diarrhea due to spleen deficiency, it is combined with herbs of tonifying spleen, draining dampness, warming the middle, and astringing intestines, such as Bai Zhu, Sha Ren and Rou Dou Kou. It is combined with Rou Dou Kou and Chi Shi Zhi in the formula Dou Kou Yin from Shi Yi De Xiao Fang. For chronic diarrhea due to deficiency cold of kidney and spleen, it is combined with yang-warming and cold-dispersing herbs. For instance, it is used with Bu Gu Zhi, Rou Dou Kou and Wu Zhu Yu in the formula Si Shen Wan from Nei Ke Zhai Yao. It can tonify kidney, astringe essence and relieve emission, so it is a usual herb for seminal emission and spermatorrhea caused by insecurity of essence gate due to kidney deficiency. It could be decocted into plaster singly, or combined with kidney-warming and essence-astringing herbs. For instance, it is used with Sang Piao Xiao, Fu Zi and Long Gu in the formula Sang Piao Xiao Wan from Shi Yi De Xiao Fang. It is a common herb for sweating of deficieney, because it can tonify lung and heart qi, strengthen superficial to check sweating. For spontaneous sweating due to qi deficiency, it is combined with qi tonics, such as Ren Shen. For night sweat due to yin deficiency, it is combined with yin tonics. For instance, it is used with Shu Di Huang, Shan Zhu Yu and Mai Dong in the formula Mai Wei Di Huang Wan from Yi Ji. It can nourish yin to relieve thirst, and tonify qi to improve the producing of yin fluid. For thirst and sweating due to qi and yin injured by heat, it is combined with qi and yin tonics. For instance, it is used with Ren Shen and Mai Dong in the formula Sheng Mai San from Nei Wai Shang Bian Huo Lun. For diabetes, which manifests as thirst and desire for drinking and is caused by internal heat due to yin deficiency, it is combined with heat-clearing, yin-nourishing and fluid-producing herbs. For instance, it is used with Shan Yao, Zhi Mu, Tian Hua Fen and Huang Qi in the formula Yu Ye Tang from Yi Xue Zhong Zhong Can Xi Lu. It can tonify heart and kidney, calm heart and induce tranquilization. For fidgets, palpitation, insomnia and dream-disturbed sleep due to deficiency caused by yin-blood deficiency and dysfunction of heart and mind, or disharmony between heart and kidney. It is combined with yin-nourishing, heart-clearing and tranquilizing herbs. For instance, it is used with Mai Dong, Dan Shen, Sheng Di Huang and Suan Zao Ren in the formula Tian Wang Bu Xin Dan from She Sheng Mi Pou. Besides, it can depress transferase for hypertransferase when it is smashed into powder for oral taking. Decoct 3~6 g; powder, 1~3 g a time. It is contraindicated in cases of external pathogen existence, internal excess heat, acute cough, early stage of measles.